Pay attention to your dental routine – Make sure your dental hygiene is not lacking in some manner. Brush, floss and rinse with a mouthwash twice a day as diligently as possible. A good dental regime means good dental health. Schedule regular appointments every six months with Dr. Lewandowski for your dental exam and cleanings. Check your teeth for cracks – Oftentimes, bacteria penetrates through cracks or fractures in the teeth and can wreak havoc. Inspect your teeth after completing your dental regime. Look for cracks or anything suspicious and get it checked by your Dr. Lewandowski as well. Gums need attention too – When you are checking your teeth or brushing your teeth, remember not to neglect your gums. Cuts in the gum or small abrasions can also become infected with bacteria. If left on its own, this can start affecting the teeth. Cut out bad habits – Bad habits like chewing on ice or hard candy can damage the enamel. Chewing on hard substances can also create minute fractures in the enamel which can let bacteria seep in. If you like to show off the strength of your teeth by opening bottle caps or crushing walnuts in them, it’s time to stop doing those activities since you may be harming your teeth more than you think. 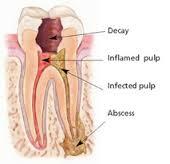 Look for warning signs – When your teeth become infected, you will begin to receive warning signs. Pangs of sharp pain, swollen sections of your gum, bleeding and other tiny signals should not be ignored. If you experience these symptoms call Dr. Lewandowski as soon as possible for an appointment. Clove oil helps – In some cases, you may want to start introducing clove oil into your dental regime. This anti-bacterial essential oil can soothe the aggravated nerves, help fight bacteria and greatly numb the pain you experience because of an infected tooth. Take timely action – Once you start seeing the warning signs, don’t leave them be. They will not get better even if you improve your dental routine. It’s always best to head straight to the dentist’s office once you see these signs developing. Crowning is a better alternative – In some cases, the damage to the tooth has not seeped down to the root. In such scenarios, opt to get your tooth capped instead. This way, the tooth does not get hollowed out. All that is done is that the tooth is packed with medication which helps fight and restrict the bacteria. A capping fixed on top seals the crack and makes your tooth whole and sound again. Know when it’s finally time to give in – In some cases, there really is no alternative way of getting away from this situation. When that happens, it’s best to get the ordeal out of the way and learn from your mistakes. By practicing better dental hygiene, you can save yourself from root canals in the future.